Welcome to Birmingham’s premier game shop! We are proud to host Birmingham’s largest selection of games. We stock a huge range of board games from a wide variety of genres, from classics to the latest releases. Our staff are always on hand to help you find what you’re looking for, or give recommendations if you want to try something new. While we endeavour to keep a wide selection of games in the shop, we only have so much space; if you have something specific it’s a good idea to contact us ahead of your visit so we can make sure you wont be disappointed. 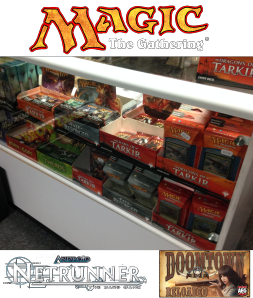 We specialise in Magic the Gathering, Doom Town and the full range of Fantasy Flight Living Card Games (Star Wars, Game of Thrones and Call of Cthulhu). We host regular events for many of our card games including bimonthly FNMs for Magic. For more information check our events page on Facebook (www.facebook.com/wforge/events). If you’re new to the card games scene, we stock core sets and beginner products for our full range. Our miniatures stock include games ranging from Historical to Fantasy & Sci-Fi and everything in between. 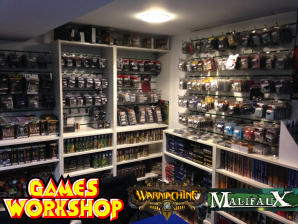 Lines include Games Workshop, Warmachine, Malifaux, Otherworld, Perry, Crooked Dice and many more. We also have a good selection of hobby supplies, a huge selection of paints and a range of scenery including 4Ground’s gorgeous pre-painted products. We can order many products at customer request, so if we don’t have what your looking for in store chances are we can get it. In 2014 we moved to the Custard Factory in Digbeth. This is a short walk from the centre of town and easily accessible from the Bullring and Birmingham New Street. Simply walk along Digbeth High Street from the Bullring and St. Martin’s Church until you see the Custard Factory and we are down the stairs from the front entrance. If you have any trouble finding the store don’t hesitate to give us a call and we’ll do our best to direct you.